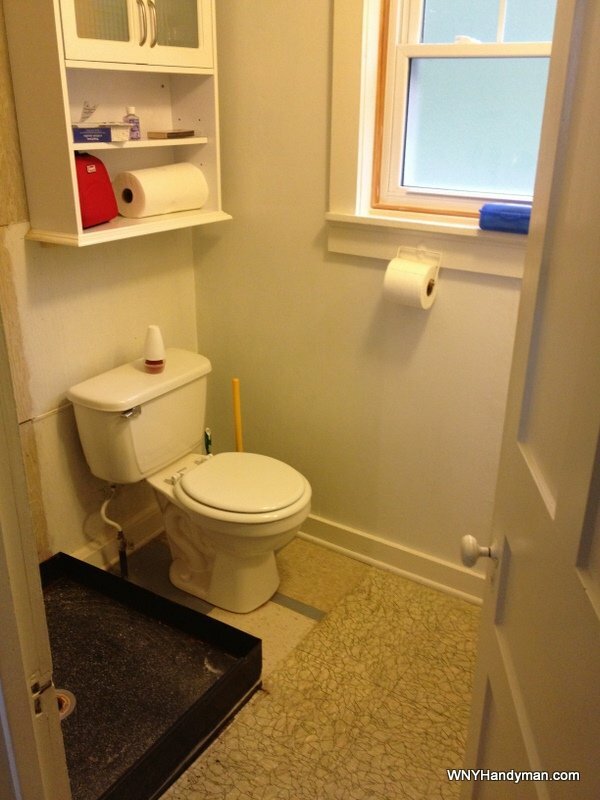 Do you have a very small bathroom and want to make efficient use of the space? I do. I have a bath that is 6′ x 5′. 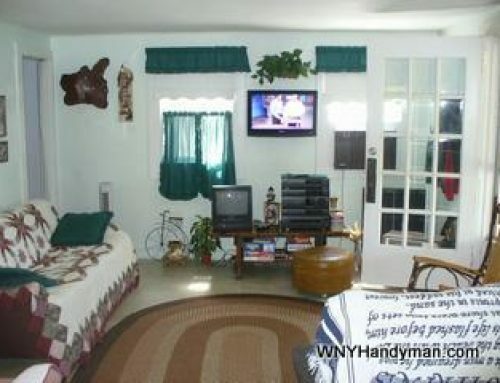 Obviously, this is a very small space for a 3 fixture bathroom. 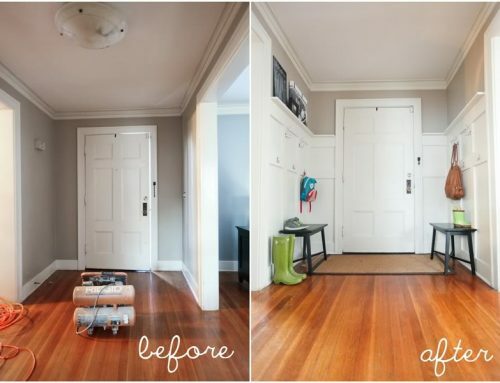 However, there are some great options to squeeze all of your fixtures into this space. 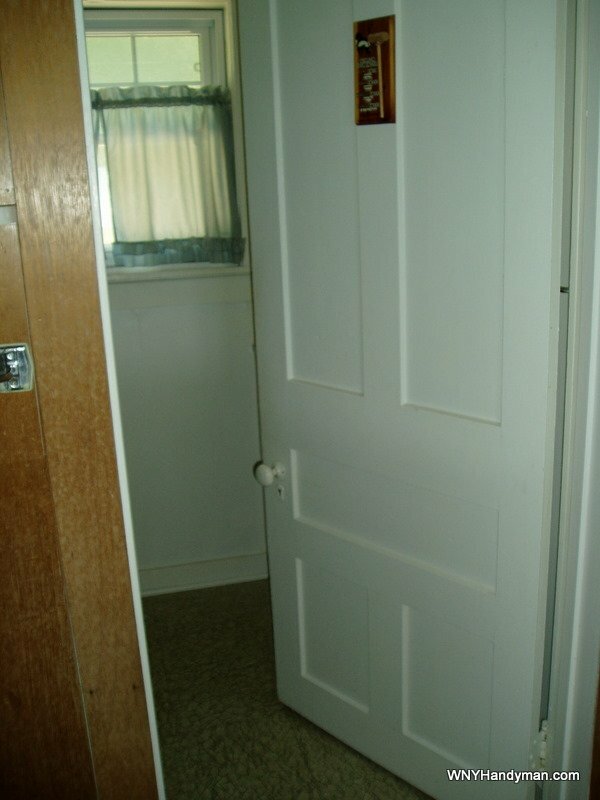 One of the issues that compounds my problem is the 32″ door that swings into the bathroom space (see image below). The current layout has worked for 60+ years, but the shower was on its last legs and needed to go. The current shower was essentially a 30″ x 30″ tin can. It was very likely a shower from an old ship or submarine. At 30″ square, it isn’t too accommodating to most normal sized adults. There is a lot of clanking from flying elbows when an average size person washes their hair. The room was too small to get a good photo of the old shower, but I did include a shot of the shower with 2 sides ripped off. As you can see by the condition, it was clearly time for this fixture to be sent to the scrap heap. We decided there weren’t too many options as far as the layout in this space. The current layout is tight, but it seems to work. We’ll keep the fixtures in their current place, but we will go ahead with some necessary changes. The shower is certainly the elephant in this room. There is not enough space to enlarge the shower size by much, tut there are a couple of things that we can do to pick up a few inches. The plumbing for the shower is between a finished wall and the shower shell. We can easily open up the wall and move the pipes to the inside. This alone picks up about 1 1/2″ inches. That might not sound like much, but stand in a 30″ shower and then stand in a 32″ shower. You will realize that the difference feels significant. By moving the plumbing into the wall, we are able to use a 32″ shower. Since this is a corner shower, our options are limited even further. 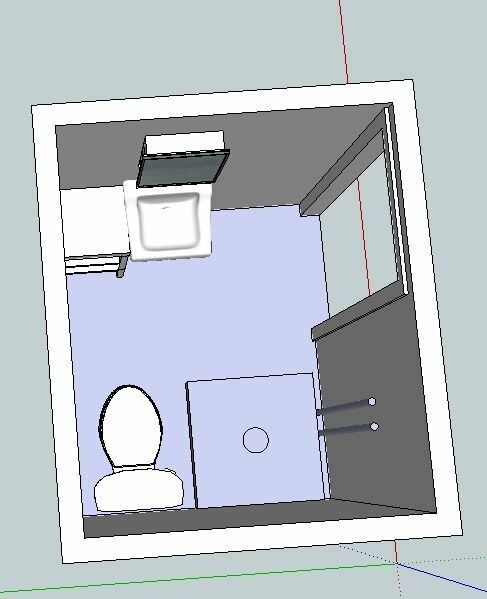 We do not have the space to construct an end wall and still have proper clearance for the toilet. 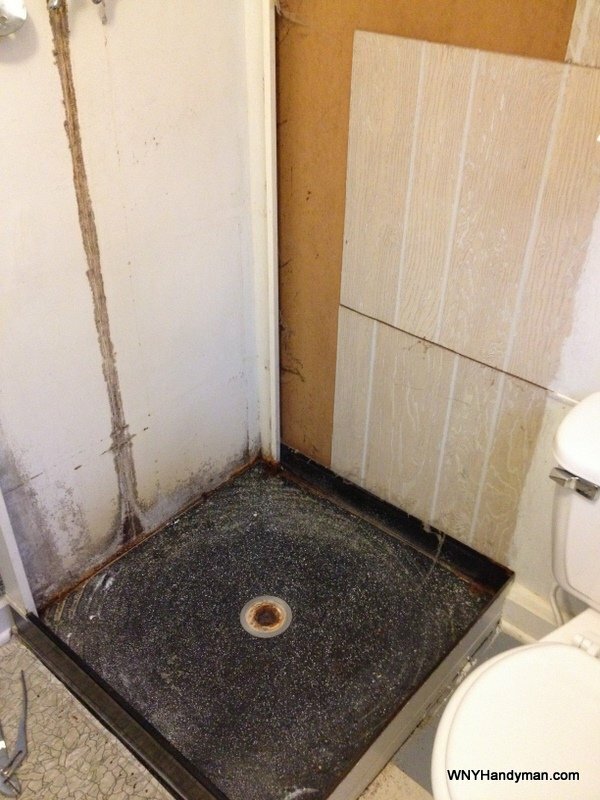 Our solution to this problem is to avoid the 32″ corner shower unit and to simply utilize a 32″ corner shower base from Home Depot. Rather than the complete corner unit that has a glass enclosure, we are opting for a ceiling mount shower curtain that is on a shower curtain track system. This will give us the enclosure we need as well as allow for a larger feel in the bathroom when the curtain is pulled back. In addition to that, it provides simple design options with the change of the shower curtain. The sink is s small wall mount unit that is built into an open shelving unit. 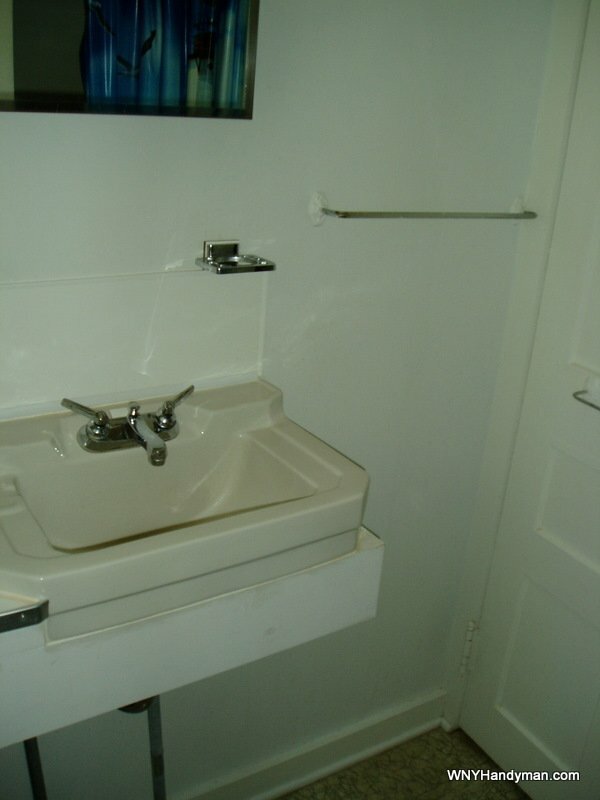 It is in decent shape, but we are going to make the room our own, so the 1960’s sink needs to go. We are likely to replace it with a nice unit from IKEA that will give us more functionality with a cabinet below and a larger bowl. The depth from the wall isn’t as much, but the sink itself provides a larger bowl. The old sink has a lip on the front and back that takes up a good 5″ of the approximately 15″ depth. 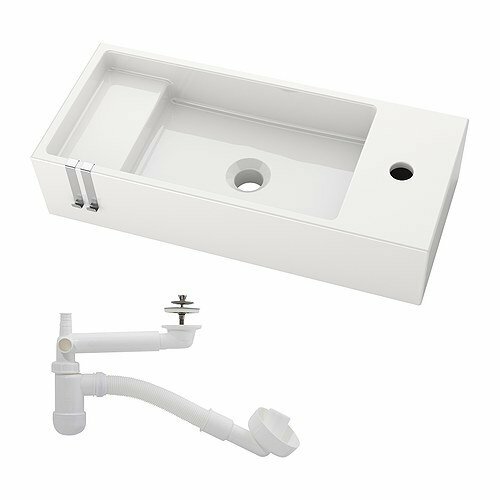 The beauty of this wall mount sink from IKEA is that we gain a lot of space in the sink bowl and also decrease the depth from the wall by about 4″. This is huge amount in a small space. The toilet is a major move that doesn’t need to happen. This fixture is in a decent place and is even a newer unit. This toilet will remain where it is and will only come out to allow us to do the finish work in the room. We are likely to tile 2 entire walls of the bathroom with a large tile in a running bond pattern. 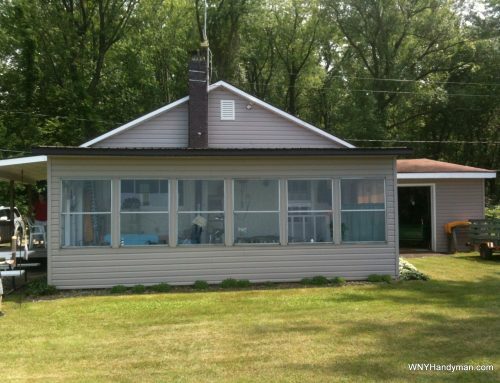 Needless to say, we’ll post updates to this bathroom renovation project when it takes place. 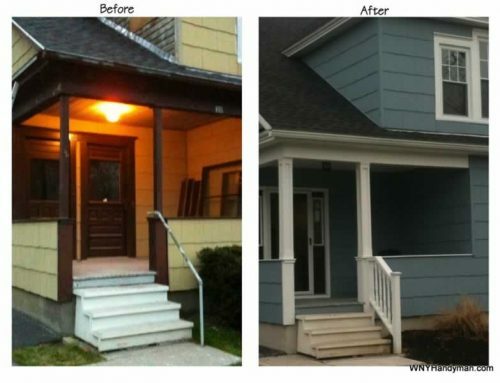 Unfortunately, this renovation will have to wait. This bathroom is located in a seasonal cottage that won’t be opened up until the spring. In the meantime, we can plan and purchase. 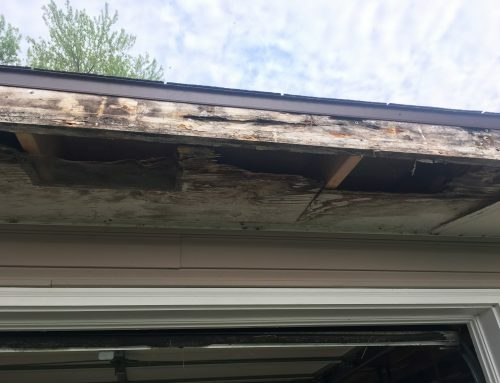 This will speed the renovation when the hammer starts swinging.